This article is sponsored by VESTA, the Viticulture and Enology Science and Technology Alliance, a NSF funded partnership between the Missouri State University system, two year schools throughout America, state agriculture agencies, vineyards and wineries with a 21st Century vision for education in grape growing and winemaking. While 58.1 percent of wine drinkers are female (according to the Beverage Information Group), only about 10% of winemakers worldwide are female. Why the disparity of female winemakers? Karen Hand, head winemaker at Blue Sky Vineyard in Southern Illinois, says, ‘Many winemakers start in the vineyard, which is known for its heavy labor. It’s not the glamorous life of barrel tastings that people necessarily envision.” The good news is more women are attending viticulture and enology programs both in California and the Midwest. According to VESTA Director, Michelle Norgren, during the 2013-2014 academic year, 39% of students are female. (VESTA provides certification training in viticulture and enology through 19 academic institutions in 17 states.) In a recent Inc magazine article, ‘Where are the Woman Innovators?” the authors found women, ‘generally talk more about their partners, their support system, and mentorship. They value teamwork more than the guys.” Almost every woman interviewed for this article echoed this sentiment. Women are often better communicators and that’s an advantage when overseeing a winemaking or vineyard team. The four female winemakers profiled below are typical of Midwestern winemakers: self-taught with professional degrees and experienced in the vineyard. My parents took a local winemaking class and were hooked. My Dad wrote a letter to Fresno State University asking for me to be enrolled in their viticulture and enology program. It was very low tech compared to the application process now. I graduated in 1976 and opened my first winery with my parents in McGregor, Iowa and produced 500 gallons of cherry wine. How did you end up in Galena, Illinois? We were always driving through Galena and we just loved the small town feel. We were one of the first businesses to renovate a building downtown. In 1985, we opened Galena Cellars. How many wines do you produce per year? We make over 40 wines, 60,000 gallons annually and sell 90% of our wine in our three locations. What is the award you are most proud of? Most recently, Galena Cellars won ‘Winningest Winery” at the Indy International Wine Competition, with over 20 winning wines. Since I have been through an enology and viticulture program, I can see the huge advantage a winemaking education can have. Both of my kids also have their viticulture & enology degrees from Fresno State University. I am a real advocate for programs like VESTA in the Midwest. Also, I meet once a month with local winemakers from August Hill and Prairie State Winery for feedback on my own winemaking. What wine are you most proud of? Of all the wines that I have had a hand in producing, my favorite is Eric the Red, named after my son. It is made from the French hybrid Marechal Foch and is our flagship red wine. What grape will define the Midwest? While many California wineries focus on one or two varieties, in the Midwest we are producing many different varieties. Which varietal will make the Midwest known worldwide? To help with this effort, I have worked with the state viticulturist in experimenting with different grape hybrids in our vineyard. Is there an advantage to being a female winemaker? I think female winemakers have a natural advantage over men starting out because most women grow up in the kitchen and already know the smells of spices and cooking ingredients. After receiving two masters degrees in Psychology, I thought I had found my calling working with troubled teens in a wilderness program. Through that program, I got my first taste of vine management at Alto Vineyards. Realizing that I loved being connected to the earth everyday, I started working at Owl Creek Winery in 1995 as an assistant winemaker and vineyard manager. Which do you prefer, viticulture or enology? I still prefer the vineyard. Having good vineyard practices makes a huge difference in the wine. When did you join Blue Sky Vineyard? I became head winemaker at Blue Sky Vineyard in 2006. How much wine do you make at Blue Sky Vineyard? We make 18,000 gallons per year. What is your most proud accomplishments as a winemaker? I was so proud in 2011 when Blue Sky Vineyards’ Cabernet Franc won a gold medal in California’s Grand Harvest Award and a Gold Medal at the San Francisco Wine Competition. This was especially exciting because these are international competitions and because the Cabernet Franc is a vinifera variety of grape. We are able to grow it due to our long growing season and our higher elevation. My goal is promoting to the world that the Shawnee Hills Viticulture Area makes really good wine. 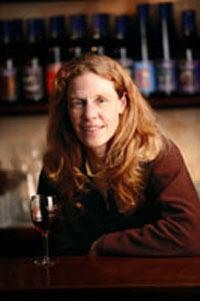 Is there an advantage to being a woman winemaker? I feel like I have an advantage as a winemaker, not due to palette, but because I’m a good communicator. Plus, having two psychology degrees comes in handy while managing workers and understanding customer feedback. What advice do you have for aspiring winemakers? How did you get your started in making wine? My journey to making wine didn’t happen over night. I was living in downtown Chicago and had a well paying IT job, but I felt like something was missing. I had friends from college that purchased a vineyard in St. James, Missouri and I decided to follow suit and bought a 15 acre vineyard. My last day in Chicago, I went to cash my last check and realized I forgot my banking card. I had been using this same bank for years, but the teller refused to cash it without my card. Who did you first sell your grapes to in the 1980’s? Why did it take you so long to try making wine? I was intimidated by the chemistry. I took every class offered by the Missouri Wine and Grape Board, talked to other winemakers and attended every workshop I could. Once I got started, I realized it wasn’t as hard as I was making it in my mind. 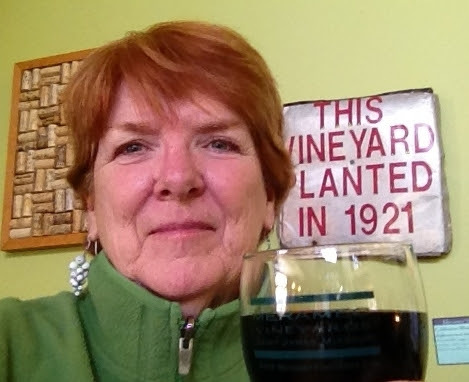 I opened Meramec Vineyards in 2000 as the first woman founded and owned winery in Missouri. How much wine do you make each year? In 2013 we had 5 acres of vineyards produce over 10,000 gallons of wine. I’m most proud of two wines. One, is the 2005 Gold Medal in the Missouri Wine Competition for a semi-sweet Concord. I love the fact that we made this unpretentious grape into a semi-sweet, instead of a sweet. Plus, these grapes are from a vineyard that was planted in 1921 during prohibition. It really gives tribute to the Italian roots of this area. The other wine I’m most proud of is our best seller Silvio’s Red. This is named after the Italian immigrant that taught me everything I know about vine management. Silvio Red is a semi-sweet blend of the Norton and Stark Star grapes. The Stark Star is a cross of the Norton and the Catawba created in the 1880’s and we are the only place that still grows this grape. I read a recent study that women have better palettes. Plus, I think women really excel in being good communicators. How did you learn to become a winemaker? That same summer we bought our first wine kit and proceeded to make several 5 gallon carboys of wine. I really learned to be a winemaker practicing on many wine kits, read a lot of books, and talked to many winery owners/winemakers. When our first harvest came off, we had help from Ron Durso of Durso Hills winery in getting our first wine off to a good start. What is your biggest challenge as a winery owner? I love being a winery owner, but our greatest challenge is juggling the winery on the weekends and with our full-time jobs. My husband is a 4th grade teacher and I am a Math instructor and department chair for both Science and Math at Three Rivers College in Missouri. We have been open since 2009 and are open just on the weekends. I’m very proud of all our wine, but the very first Chambourcin we put through malolactic fermentation is the wine I am most proud of. It had a great balance. Our Chambourcin wines since have been good, but the first one was our best. 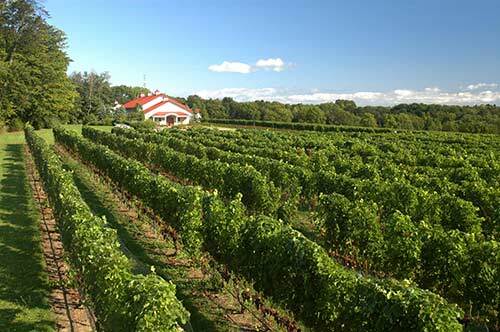 What size of a winery is Indian Hills Winery? Our vineyard is now at full production and we can bottle about 7,000 bottles per year. We sell nine different wines made from Chambourcin, Cayuga, Traminette and LaCrescent grapes. Congratulations to these hard working ladies! Cheers to all if you. Nicole Dietman is the owner of her own vineyard and mother of two! 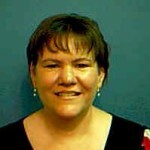 Cyndy Keesee is the winemaker at Edg-Clif Farms and Vineyard in Potosi, Mo. 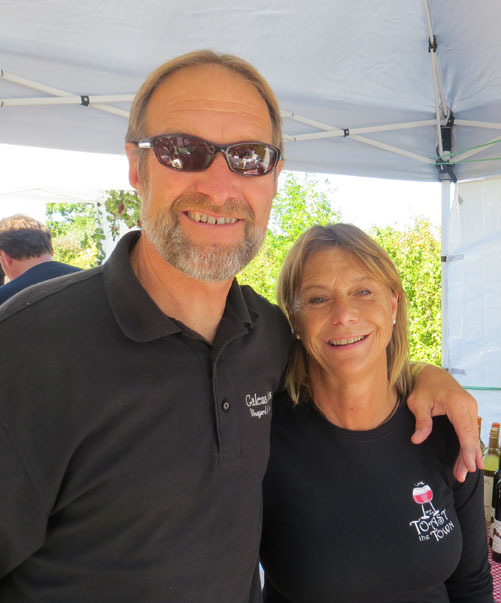 She does amazing things with ‘Chamborcin Grapes, She makes Chambourcin wine 8 different ways! Thanks for your note about Edg Clif, we did a profile on Edg-Clif during April. You can find it currently on the home page, but it can also be accessed through the Missouri section of MWP. Next story Will Wine Tourists Become Weed Tourists?